Spring Pictures and JPO Dress Down Days! JPO DRESS DOWN DAY – FRIDAY, MARCH 18TH! Our fundraising efforts for our JPO program were a success. We exceeded our goal of $200. Students may dress down on Friday. Please make sure that their attire is school appropriate. Mahalo for your support. SPRING PICTURE DAY – THURSDAY, MARCH 17TH! Spring Pictures will be held on Thursday, March 17th, 2016. If you are purchasing pictures, your child does not need to wear his/her school uniform. We do ask that any dress down clothing they wear, be school appropriate. 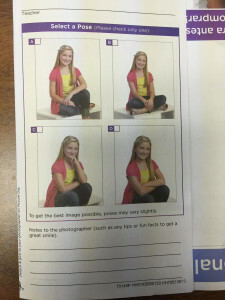 All you need to do is select a pose (see picture below) and return the form to the photographer. You do not need to send any money. After Picture Day, pictures will be sent home for you to review. You will send back what you don’t want and pay for what you would like to keep.